Lower extremity injuries, in particular the foot/ankle are one of the most common in automotive crashes. Although not life threatening, they can lead to long term medical complications or permanent disability[²]. In most cases foot and/or ankle fractures are caused during frontal automotive crashes, while the driver attempts an emergency brake and the foot is subject to crash loading [³]. In these cases, fractures of the forefoot, in particular the metatarsals are very common  and range from simple fractures to severe crush injuries . The location of metatarsal fractures in a car crash victim can be dictated by the loading pattern . However, there is little information about whether the pedal has an effect on the mechanism or extent of injury. In order to evaluate the effect of brake pedal loading on the injury tolerance of the metatarsal, a computer based finite element analysis was performed to assess the regional capabilities in terms of loading transmission around the forefoot. 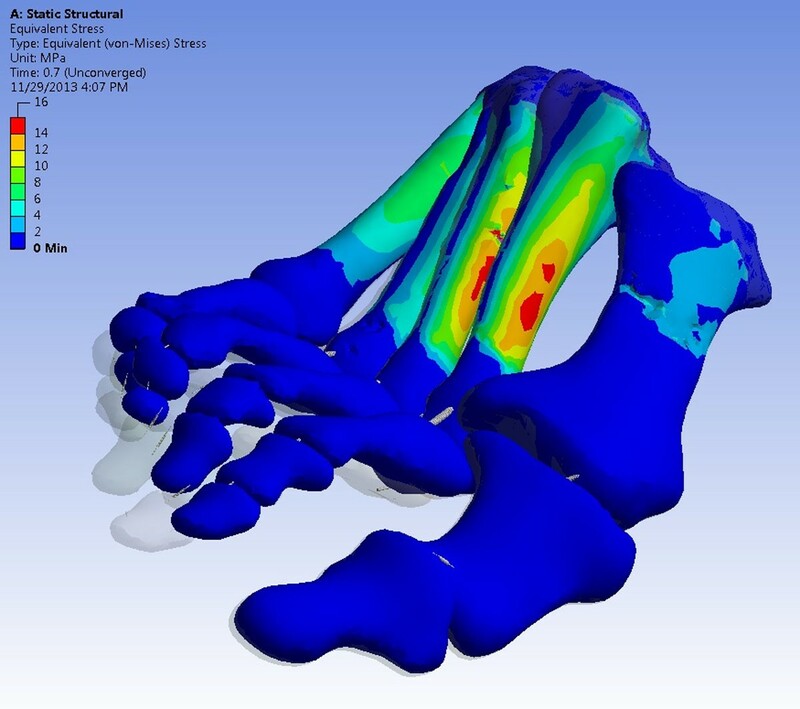 A Finite Element (FE) model of the foot and ankle was developed from a 3D reconstruction of CT images  of a female subject using Simpleware (Simpleware® Ltd) segmentation software. The model was then imported into ANSYS Workbench for FE analysis (ANSYS® Academic Research, Release 14.0). Material properties for the analysis were assumed to be homogenous and linearly isotropic. The cortical and simple ligamentous structures attaching the bones together were modelled. Variable pedal forces obtained from automobile crash data were applied to the forefoot region (i.e. ball of the foot) of the model, and the loading patterns of stress were analysed (Figure 1). The maximum stresses and angles of deflection were obtained from applying a range of pedal forces (2kN-10kN). The resultant predicted loading patterns for the metatarsals were then analysed (Figure 2). The highest stresses were found at the smallest cross-sections of the metatarsals. Although bending stresses increase with increasing distance from the point of load application, the larger cross-sections compensate for this effect. The results of the current study show that the locations of the maximum stresses appear on the second and third metatarsals. This compares with findings from crash data.